Scala IDE 4.3-vfinal is out! We are happy to announce a new Scala IDE release that contains beside of some bug fixes, a new Outline View and a so called Statistics Tracker. 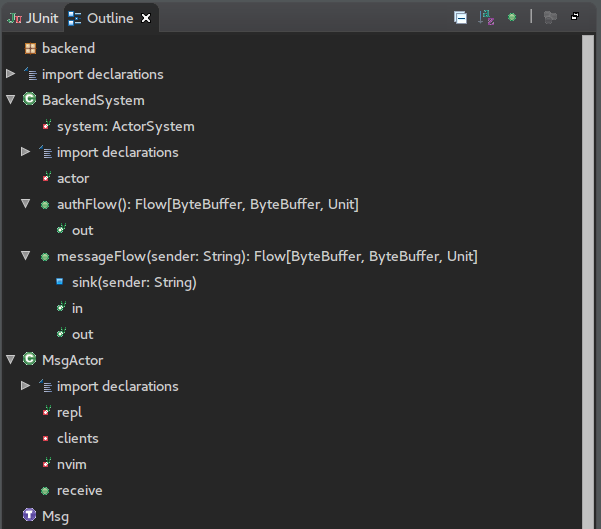 The old Outline View, which shows you the structure of the Scala file that is shown in the active editor, got a replacement by a new implementation. The old implementation was provided by the Java IDE of Eclipse and therefore was never a good fit for Scala code. The Scala IDE translated its internal information into a format that could be understood by the Java IDE but this conversion was not without its drawbacks. Since not all syntactic valid Scala elements have a representation in Java, some elements were shown wrong or not at all. The new implementation is a complete rewrite in Scala for Scala code and therefore is a huge improvement over what was available before. Note, that the Outline only shows syntactic information. It doesn’t show anything that you can’t already see in the source code. This means that for example no return type for a method is shown, when there is none in the sources. In case you want more semantic information about your currently opened Scala file, you should have a look to the scala-search project, which can be installed through the update-site. A further note is that all import declarations are collapsed by default. If you want to change this behavior, navigate to Preferences > Scala > Editor and disable the behavior in the Outline section. 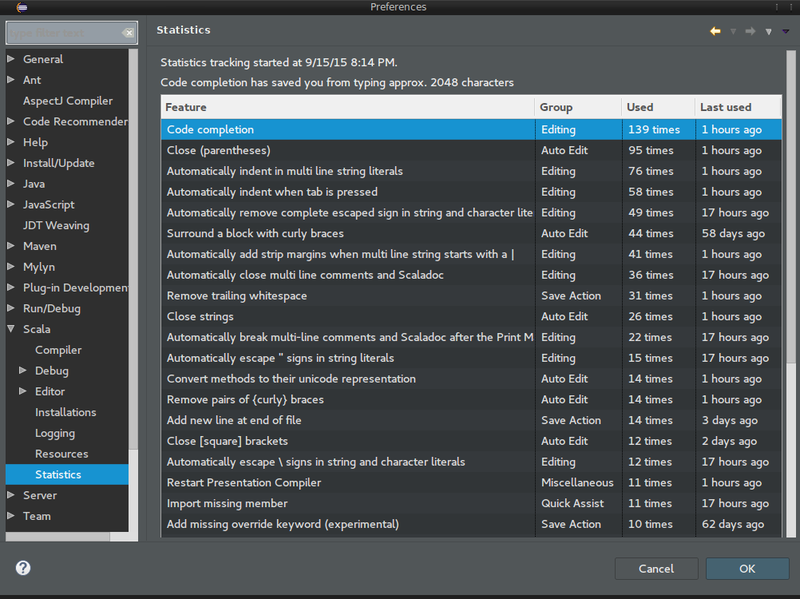 The storage location for the statistics tracker can be changed in Preferences > Scala to any location you like. Note, that it is possible to share the storage location between multiple instances of Scala IDE running at the same time. In case you do not wish that any data is shared, you need to configure multiple storage locations. Instead it stops in the first receive method it can find, which in this case is the one of LoggingReceive. In order to avoid using the “Step until next message is arrived” multiple times, the Async Debugger now allows you to skip receive methods by defining classes or packages that should not be considered by the Async Debugger. You can do this per runtime configuration. 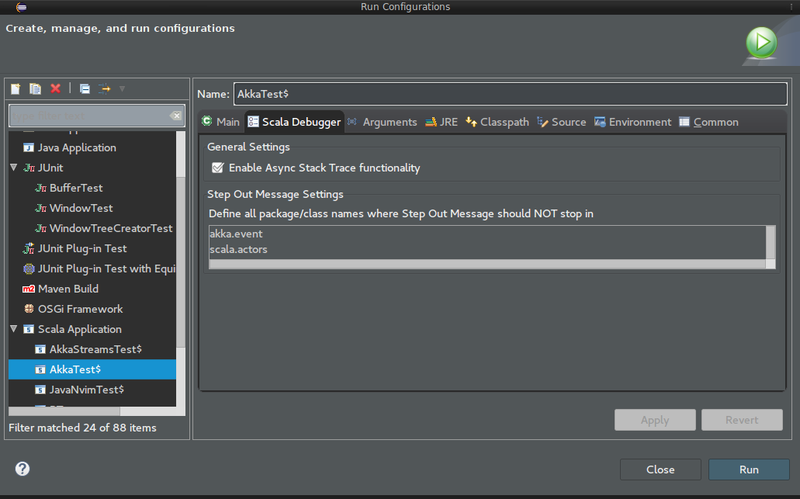 Go to the runtime configuration of your choice (for example by navigating to Run > Run Configurations...) and then select the tab “Scala Debugger”. Here you can configure all the classes and packages that should be skipped. Note, that each entry needs to stay in its own line. As it was the case for the previous release, this release also comes with some improvements in the refactoring support. Another useful import strategy was added as well, it is called “Preserve only wildcards; one import statement per importee otherwise”. It basically allows you to explicitly add wildcard imports without Organize Imports destroying it because it wants to add only single import statements. This option can be chosen in Preferences > Scala > Editor > Organize Imports. "org.scala-refactoring" %% "org.scala-refactoring.library" % "0.8.0"
For this release we want to thank especially Andrey Ilinykh, who contributed the new excellent Outline View.